I had a playdate yesterday, where a friend came over for some cake and a chat (don't worry she brought her child as well). We talked about lots of things but one I thought was interesting was when she asked me how I felt about children helping or working. Now I'm not talking about sewing Nike trainers in a sweat shop here, more helping around the house and in my case helping out on the farm and garden as well. I've never really questioned whether this is right or wrong, for me the children "help" and that's just how it is. Sometimes they want to, other times they don't, but they still have to pitch in, even the boy at 20 months. In fact yesterday was a prime example of this, as my dad had come over to help me wean the lambs and sort out a few cull ewes. 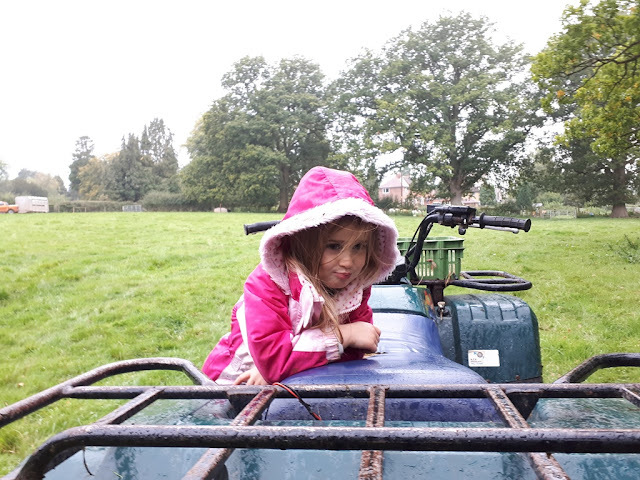 I had the children all day so they had to be out there helping us, to start with they were quite happy as we rounded them up, but as we got near our second hour they were both getting bored, a little wet from the rain and obviously wanted to go inside. They didn't though - as I had to stay until the job was done, they found ways to amuse themselves, picking blackberries and playing on the bike, but they'd definitely had enough! 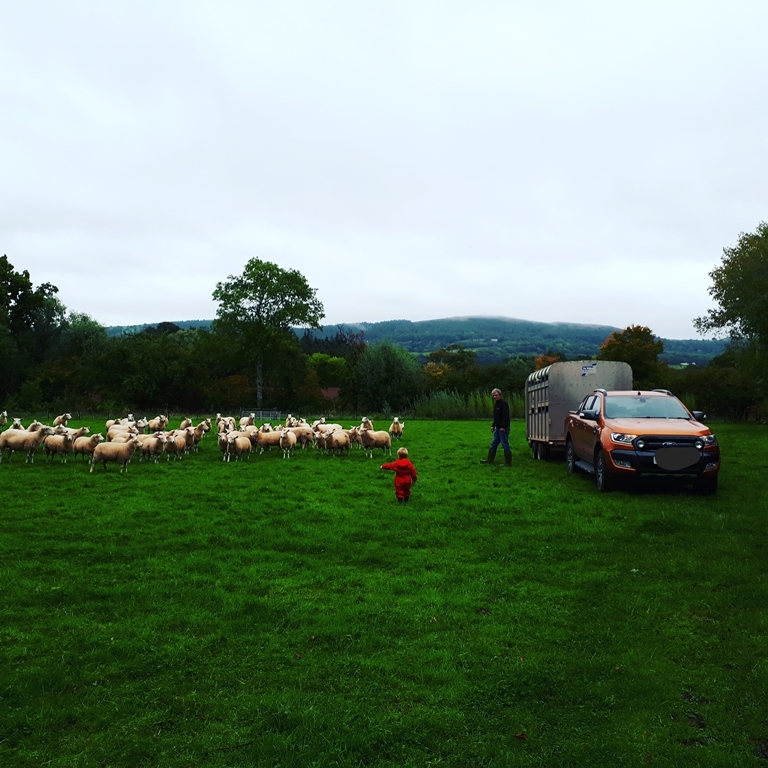 I said to dad that "I keep sheep differently to most, I normally have three kids in tow." He just said "Well that's how I did it as well". We emulate our parents without even realise it sometimes. I remember so many hours of things like this, learning through osmosis. Done with the job for today! He just wants to go in! The day before they put their own toys away in the sitting room while I hoovered, although I had to do much nagging to get them to do this. And yesterday they helped me bake a cake and some bread for lunch. Things like being able to send my eldest off to get herbs and veg from the garden for tea is really helpful as well. But don't get me wrong, them helping doesn't mean that my jobs get done any faster, in fact normally quiet the opposite! But it should make things easier when they're older and they're building skills and hopefully a work ethic which will last them a lifetime. But I'm glad that my children already help out, and they seem to enjoy it. The look of pride on my daughters' faces when I put them to bed and say "Thank you for helping today," says it all as they beam back at me and say "You're welcome". I don't want to spoil them by making their lives too easy! 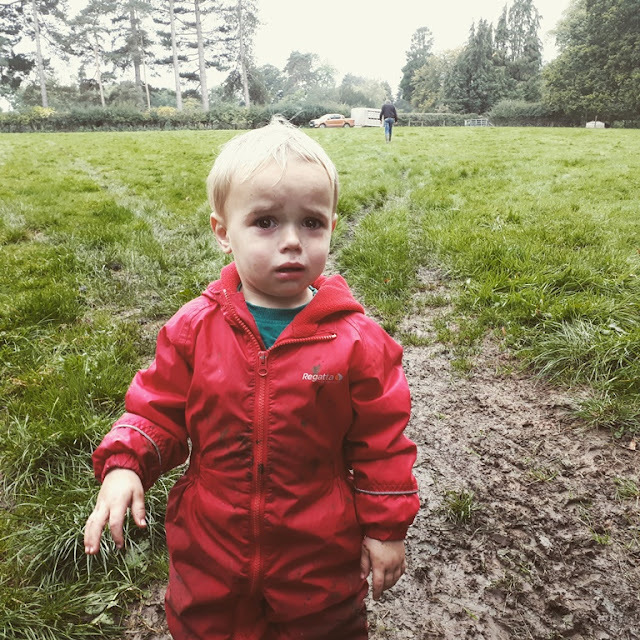 Should I be making my children help me or just letting them play? I bet they get lots of playtime as well. 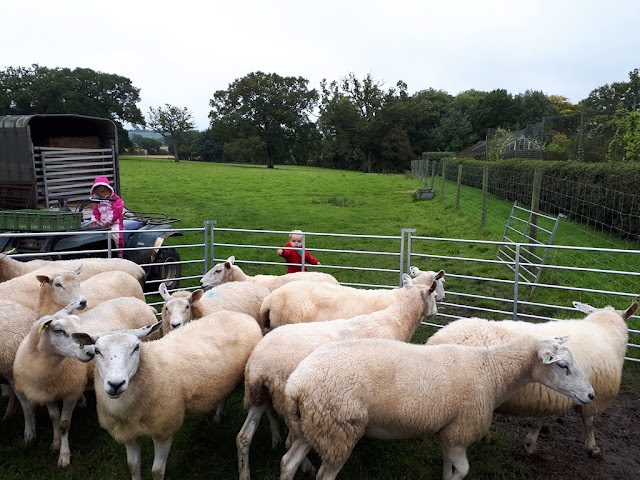 Your children will be adults one day; they're going to need some of these skills, maybe not the rounding-up sheep ones but they will need to feed themselves and look after their environment. I would guess that they love knowing that they are helping with 'real' work, and that's especially important for your daughters, who will have a sense of their own value. The occasional spell of boredom is good for children - it builds imagination! I think boredom is great for children, I remember all the games I used to make up when I was a child! (or even now). I think they really know when they're helping and love being thanked for it. I think you're doing just brilliantly Kev, your kids will grow up to be well-rounded people and not useless layabouts. Keep it up! Hope so, I guess time will tell! They might rebel if I push too hard is the only trouble! Our competitive world, means as adults, we have to do more than our role description, staying to finish a job is an important skill to give your children. It does not matter if you call it help or work, it's the same thing, and once again I truly think you have great parenting skills. Our parents had the correct idea, nothing fancy, get the jobs done then fun time. Extra skill sis real selling point. I remember one of my first proper interviews for a big job (when I had a career) and they were so impressed by my extra skills in farming and in other areas, they kept asking me questions about non building stuff in the end! Yep, I think we all want things to do, doing nothing is great for a few days then I get itchy and need to do something! I agree. This notion that children should do nothing but play and then suddenly be expected to function as an adult, with skills, knowledge, and an ability to care for themselves, is relatively recent. I have a friend for whom 18 is a magic marker for when they expect their children to be able to fend for themselves and I wonder how when they've done EVERYTHING for their children up to that point. I think it's funny that parents think their children should play all the time. mine have to help and be bored! Bear in mind you are creating your children's childhood memories now. I think kids need more of the type of home/work time that you described. Too many modern families over schedule their kids lives. Too many clubs, teams and days out. These are great in moderation, but children (younger ones, especially) learn by emulating adults. If the adult is showing self reliance, hard work and love of nature then I'd say you are right on track. When my daughter was younger her "work" was mostly related to personal responsibility, such as picking up toys, putting her plate in the sink, etc. She readily engaged in more family oriented chores at this time such as sweeping, gardening etc., but they were not expected of her. As she has grown (now 12) she has more responsibility, but they still center around her interests (feeding the animals, cat litter, walking the dog, cleaning up after she cooks something, etc.). Her favorite times are working on a project together. For example, we have been working on a new chicken run. Before school this morning she asked if we could please put up the rest of the chicken wire tonight. Like begged. A the moment poeple keep encouraging me ot sign my kids up for more clubs but I'm not so sure. They get lots of fulfilment here and it means that I'm driving round all the time not getting anything done. Also I enjoy teaching them things and they also need time to rest and just be kids. Great that your daughter wants to help so much - I hope mine are like that when they get to 12! I can totally relate to your children being more hindrance than help! Our middle child has Downs Syndrome and, although it would be easier to just do things ourselves, we insist that she do chores just like her siblings. Hence, only some of the food gets swept up after dinner, dishes are put away in unlikely places and, though the vacuum is run, it rarely touches the ground. Lol! Nevertheless, I really think it is our job to help our kids prepare for life outside the nest. Seems to me you are doing a GREAT job of this! Not so much a hindrance but I have to lower my expectations on how much I want to get done, sometimes they surprise me! Your middle child sounds amazing! Willingness to work is more important than anything else and she sounds like shes got that sorted! Ok. I am a bit baffled that "not helping" would even be an option. Sure, it's not like my 2 yr old is helping me with canning but there is nothing he gets satisfaction out of more than a job where he can be a productive little person and contribute. I believe it gives him self worth. I figured we'd be on the same page on this one! You shoudl have seen my boy making a cake last week, more on him than the bowl but he loved it! What is work and what is play? If someone keeps chickens for fun , then cleaning them out comes under the heading of play. Childen are our responsibility and pleasure to educate and that means introducing them to life ,in its many aspects, and allowing them to learn of it in a safe space , up to the limit of their abilities. You are doing a great job Kev, bringing them up to know that although some things are a bit hard and need to be done, that they are still enjoyable . Also giving them the pleasure of being part of your projects. Keep it up Kev. It's good question you ask! People ask me how I do so much work here but I don't see it all as work, well not all the time! Thanks for your kind comments! We always had chores around our place. My sister helped keep the house clean, and the boys worked outside with my dad for as long as I can remember. My son always helped me outside. I miss having him around for a lot reasons, not least because he was such a help with things like downed trees. My daughter worked inside with my wife to take care of the home and us. I can't imagine kids not having chores. How would they learn to take care of themselves and be responsible people? I used to think like that and then mum decided that no way were we going to leave home without being able to cook, and my brother and I had to learn the cooking side of things as well then. my sister used to be out helping on the farm as well, lambing time all three of us would be out there.